Greetings beautiful souls. I hope this message finds you all healthy, happy and aligned with your Source. We send you great Love and Light at this time to illuminate your chosen path and direction. Ever have one of those days where everything in the universe seems to be aligned for your highest well-being? 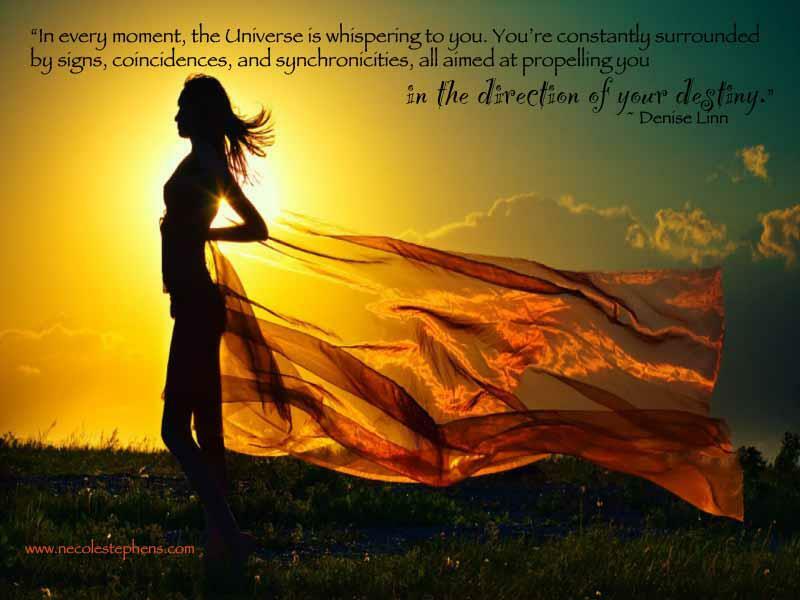 One of those days where things just magically fall into place for you, the doors are held wide open for you, gifts and abundance show up at the perfect divine time, support and helpers arrive just when you need them to? This can be called many things Synchronicity, Serendipity, and destiny to name a few. For some of us this is an occasional experience, maybe we are lucky enough to enjoy a few times during our lives. Yet for other’s, those who have unlocked important wisdom and understand the laws of the universe, this is a daily experience. Experiencing miracles and magic and synchronicity are in truth our natural state of being. And I am here to express from my hearts deepest truth that this way of life is available for us all, if we align and listen. I have always loved the magical moments and absolutely loved the syncronistic moments that arrived to surprise and delight me. I LOVED them! Yet they seemed to flow in and then out again just a swiftly. However, now after much life experience of living the contrast I understand how to stay connected with the universal flow. I have learned the importance of our vibration and our own alignment with Source. This Alignment is Key to experiencing magic and miracles and it is the most natural thing we were born to BE…The trick is to realize and awaken from the fact that we as humans have been conditioned to betray our own alignment, we have been conditioned to live in lack and in fear. We have been conditioned to doubt and to try to control the flow from fear and this lifelong conditioning has caused us great suffering. I am here to shine the light for those who are ready to choose another way, the aligned, magical, syncronistic way! Living a flowing free LOVE filled and LOVE inspired life is your natural state, it is your souls highest calling…But YOU must choose it! Our first step is to awaken and be honest with the fact that we have been trying to control the universe from a vibration and frequency of fear. This lower vibration will only continue to bring us more fearful, stressful, lackful situations and experiences. For us to realign with the magic and miracles, for us to reignite the passion and purpose of our soul, we must go higher! What does higher look like? Or more importantly what does higher FEEL like? Higher always FEELS Higher 🙂 Truly its a higher vibration, it feels loving, it feels hopeful, it feels exciting, it is a space of ease and grace and allowing. If you begin a daily practice of simply allowing, simply releasing resistance and stepping into alignment you will awaken and you let go! You surrender to the universal flow and you allow the infinite powers of the universe to support and provide for you abundantly in the perfect way. Simply spending 20-30 min a day in meditation and entering a space of ease will start to swiftly shift your vibration to a vibration of having, to a frequency of alignment and the magic and the syncronicity will flow powerfully in your direction. You will start to manifest your true goals dreams and desires and it will be very playful, magical and fun. Truth is, the universe has always been communicating with you and has always sent you signs and guidance, you just weren’t open, you weren’t paying attention. Now you can. Now is the time for great shifts. Now is your moment to step in let go and listen…Are you ready? 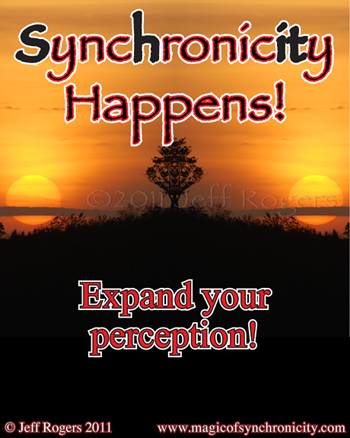 Join me live tomorrow (Monday at 4 PM Pacific) on TheTawnyaLoveShow.Com as we discuss the power and magic of syncronicity! I look forward to sharing a few of my beautiful magical moments with you all, my beautiful syncronistic loving moments…Especially the story of how my beloved man and I were brought into each others lives. I Love and Adore you Ron! For those of you who FEEL the universe has led you into my life, and you FEEL you’re ready to shift away from fear and lack…Contact me and let’s begin a beautiful conversation in assisting you into your highest alignment and vibration…I am ready to joyously assist and serve you…Are you ready to listen and choose new choices? Remote sessions are available via Skype or phone call…Your Move! For fun go watch the movie Serendipity I love that movie…another great one is August Rush, enjoy!